Sennheiser is a brand better known for traditional headphones than gaming headsets – I swear by my CX 300 II Precision earphones even if I have do have to buy a new pair every year or two. 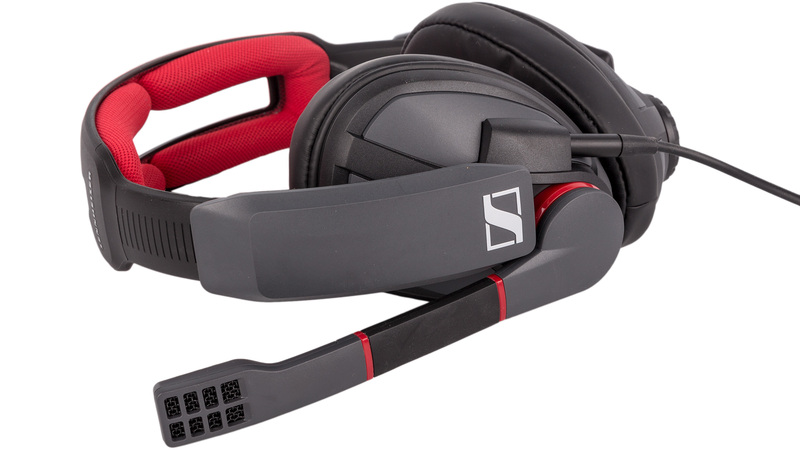 Nonetheless, the GSP 350 is not the company's first foray into gaming, but it's safe to say that Sennheiser is not a major player here. Can it change this with the virtual surround-enabled, £100 GSP 350? Red with black and/or grey is a classic theme in the world of gaming, and the red is kept to a minimum so as to not be distracting. Unfortunately, plasticky is the first word that comes to mind when looking at and feeling this headset, although it is lightweight, which brings obvious benefits. Still, some metal would certainly bolster its appeal. 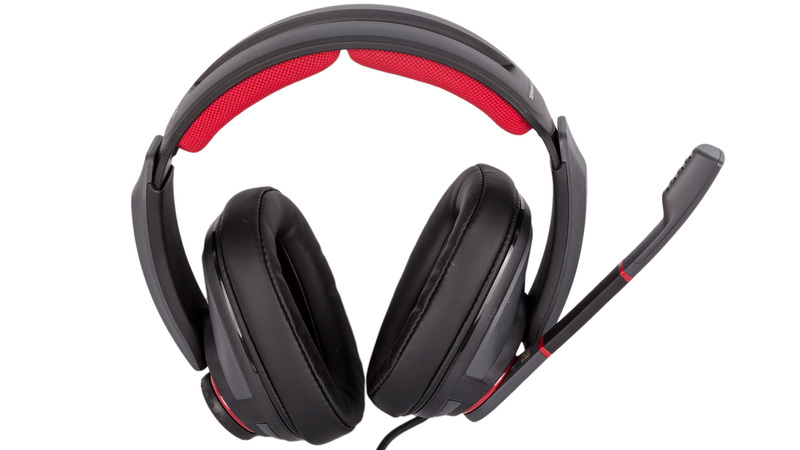 Enabling the virtual Dolby 7.1 surround sound of this analogue, stereo headset is a simple USB-based, in-line controller with a single button for it and a white/red LED to indicate on/off. From this controller, a detachable, micro-USB to 2.5mm jack cable makes the connection to the headset. Now, Sennheiser claims the GSP 350 is 'multi-platform compatible' but fails to note that you'll need to purchase extra cables for this functionality, as none are supplied as accessories. The non-removable, non-retractable microphone means mobile use is unlikely, but would it really cost so much to throw a basic analogue cable in for console connectivity? Naturally, the digital signal processing required by the Dolby surround sound means this feature is only available over USB. A wheel on the right earcup controls the headset's volume, although remember that this is independent of your PC's volume output on account of the USB connection. Even so, there's enough volume on tap here, and the control mechanism is smooth and satisfying. The left earcup, meanwhile, hosts the fold-down microphone that automatically mutes and unmutes when it crosses a certain point. It does this with a small, audible click, which isn't especially helpful if you have something playing loudly, but thankfully there's a tactility to it too, and the angle is well judged such that you shouldn't ever move it to a position where you expect it to be muted or unmuted and find that it isn't. The large oval earcups have plenty of memory foam padding covered with faux leather to create a good seal and lots of comfort for your ears. There's enough height adjustment and flexibility for the headset to adjust easily to the shape of most heads, too, and we found the clamping force to be pleasant. However, while the padding on the headband is generous in its depth, it's applied in two relatively thin strips, reducing the surface area that connects with your noggin. The result is that we noticed it more than we prefer, especially on the furthest forward part. It's minor but still a shame, as it's otherwise a very comfortable headset. You'll need to install some basic software to get the virtual surround sound to work – it's not a plug and play feature. The simplicity means that features available in other headset aren't here, but it does keep the software very easy to use. 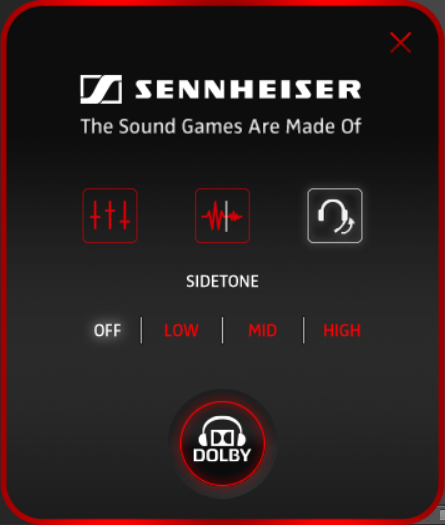 There are three main buttons with different sub-menus, though a Dolby surround toggle button is always present. 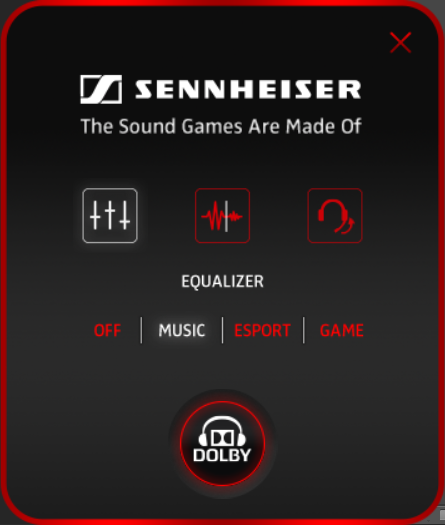 The Equaliser button has Music, Esport, and Game options as well as Off, but there's no support for custom EQs; Noise Reduction for the microphone is toggled with the second button; and Sidetone can be disabled or set to one of three sensitivity levels on the third. To be honest, this could all have been achieved without the need to separate the sub-menus, but it's dead simple to get to grips with, and all settings are only a couple of clicks away at most. The quality of sound from the GSP 350 is solid but not outstanding. With music, we noticed a bit of dominance and harshness from the mid-range, but the Music EQ actually proved to be very worthwhile here, flattening the soundscape just enough to allow the other elements to come through more evenly, though there was still some weakness with certain sub-bass frequencies, and no one element jumped out as amazing. Nonetheless, it was enjoyable to listen to rather than distracting on account of flaws. It performs well in games, too. The Esport EQ setting deliberately reduces bass frequencies to allow you to pick out finer details that might prove tactically beneficial, although the effect isn't disastrous like it is with so many other similar settings, and we could still enjoy playing with it. The Game EQ, meanwhile, gives the bass a bit of a boost for more oomph and kick. 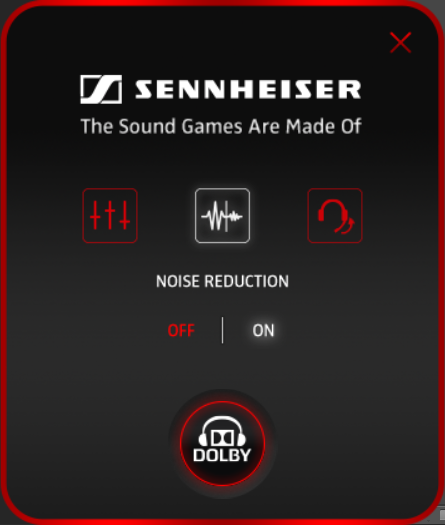 The Dolby virtual surround, lastly, was the same as always, working well enough in certain scenarios but poorly in others (always bad with music) – thankfully, it's very quick to enable or disable it and suss out if it works or not. The microphone – advertised as 'broadcast quality' – is a strong part of the GSP 350's appeal. It picked out our voice clearly, and the noise reduction works well without cutting too harshly into the noise of your actual voice. Users should note, however, that the Sidetone setting always introduces noise into the headphones even when the microphone is muted. The MSRP of the GSP 350 is £120, but it's readily available for £100. 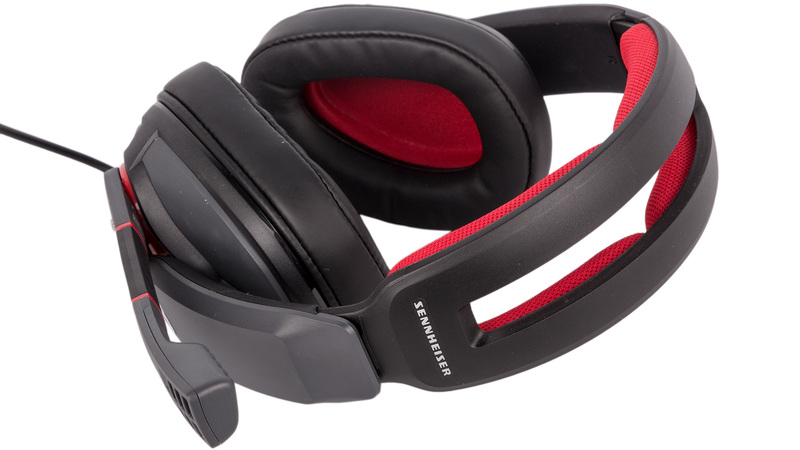 This is to Sennheiser's favour, as £120 is too much, and even £100 is pushing it. Comfort is nearly flawless, but build quality could easily be improved, and we expected a little more by way of sound quality too. Some accessories, especially a console-compatible cable, would also sweeten the deal. Taken by itself, it's an easy-to-use headset with a clear focus on gaming, no major pitfalls, and a great microphone that is probably its saving grace. When you consider that the HyperX Cloud II headset is still available for £75 and trumps this one in most areas, it's a tough recommendation, so the badge below applies only if microphone quality is a top priority.